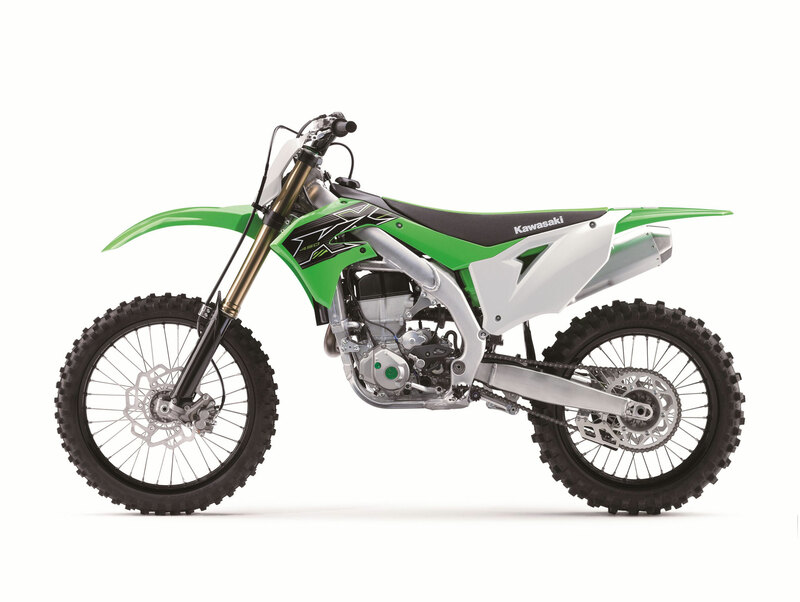 The all-new KX450 has a new engine mounted in its leanest chassis to date for quicker lap times to put its riders on top of the podium. 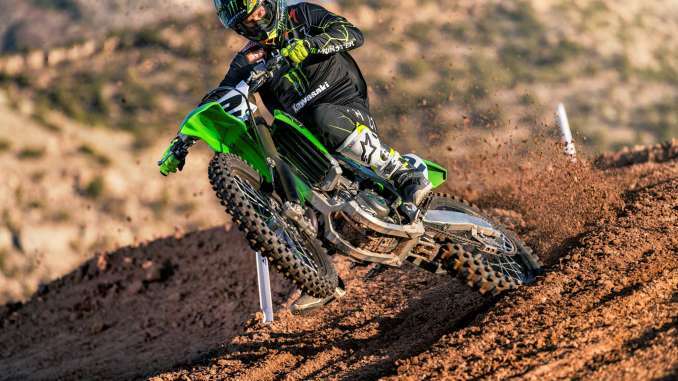 And even with the addition of electric start, hydraulic clutch and all-new 49mm Showa coil spring forks with A-KIT technology, the new KX450 remains lighter than most other models in its class. The new KX450 is built Kawasaki Strong to a high level of quality and durability. The new engine has increased peak power while a flatter torque curve makes it easier to accelerate and find traction. Kawasaki’s multi-time World Superbike Championship-winning engineers designed the new finger-follower valve train that, combined with reduced friction loss and steeper downdraft style intake tract, contributed to the power gain. fully flush internal bracing as those used on the factory racers, with a short skirt and reinforced external ribs resulting in a lighter, stronger piston. • Plain bearings replace needle bearings at the connecting rod big end to further reduce mechanical loss and help boost power. • Cylinder offset is 8.5mm forward to reduce friction and enable more efficient power generation. • Wedge-shaped crank web increases offsetting moment for a balance factor close to 60 percent, which is close to the factory bike. The high balance factor contributes to reduced engine vibration, smoother power delivery and increased performance, especially at low rpm where response is noticeably snappier. • Aluminum cylinder with chrome composite plating(KP) provides rapid heat transfer, superb wear resistance and optimum lubrication retention for increased performance and durability. • Semi-dry sump(KP) lubrication system for quicker engine response. The majority of oil is stored in the transmission to keep excess oil away from the crankshaft and prevent power-robbing stirring loss. A shallow chamber collects oil at the bottom of the crankcase, where a scavenge pump moves it to the transmission. This allows the crank to be located as low as possible to help lower the center of gravity. • Finger-follower valve actuation reduces valve train mass by approximately 6.5 percent compared to tappet-style actuation, as well as reducing friction at the cam lobe. DLC (Diamond-Like Carbon) coating on the followers help prevent wear. • More aggressive camshaft lobes have a chromium nitride coating for durability. • Intake valves were increased from 36 to 40mm in diameter and have 0.8mm higher lift, while the exhaust valves grew from 31 to 33mm and have 0.5mm more lift. Titanium valves help reduce weight. • New chromium steel valve spring retainers also reduce weight for reliable valve control at high rpm. • When the cylinder head is cast the intake port cores are coated so that they have extremely smooth surfaces for increased intake efficiency. • Downdraft-style intake routing increases approach angle from 10 to 20 degrees for an even straighter approach for intake air which improves cylinder filling efficiency to contribute to increased power. • Air flows through a thinner air filter element that is now accessible by removing the left side panel instead of the seat. • Throttle bore increased from 43 to 44mm flows more air for increased performance, especially at high rpm and overrun. A reversed orientation tilts the butterfly valve open from the top for better fuel atomization from the top-mounted injector. • Fine atomizing, 12-hole injector now sprays 75 micron droplets and flows 20 percent more fuel to contribute to the increased power, smooth power delivery and superb engine response at partial throttle. • New header pipe is 105mm longer which contributes to increased low-end power. • Exhaust system features a resonator chamber to effectively increase exhaust pipe length and reduce exhaust noise. 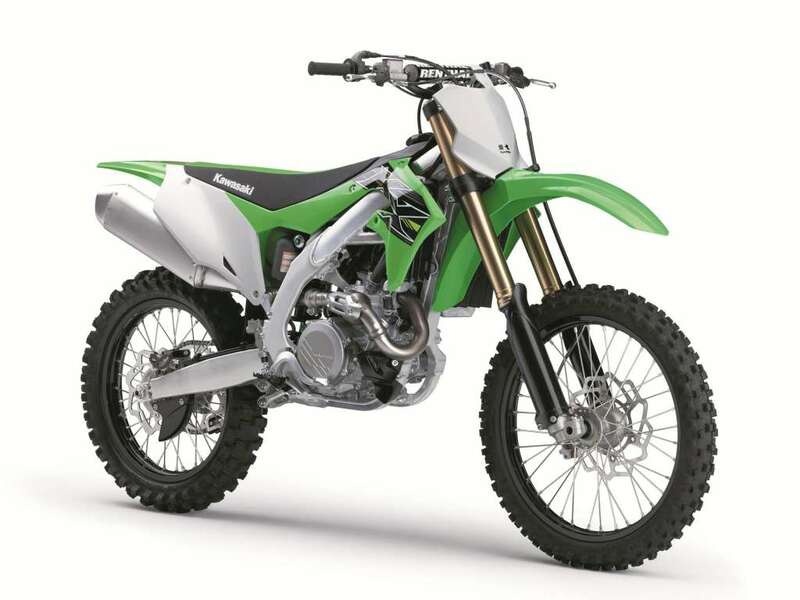 • Kawasaki’s first hydraulic clutch on a KX motorcycle offers more direct feel and lighter lever action. Less play as the clutch heats up during heavy use results in a more consistent feel. Provides the convenience of quick and easy push-button engine starting. • Powered by a lightweight, compact lithiumion battery that helps keep weight gain to a minimum. • NOTE: Only use Lithium-ion specific battery charger to help prevent fatal battery damage. • Riders can change DFI settings by simply replacing a coupler located on the right side of the steering stem. Riders can choose between Standard, Hard or Soft terrain settings to suit riding conditions. • Accessory KX FI Calibration Kit features a handheld controller that enables users to adjust engine characteristics trackside simply by plugging the controller into the engine’s ECU. • The kit’s user interface is easy to understand and easy to use. • Seven different maps come loaded on the controller to adjust the ECU to suit track conditions. Additional maps can be created and stored on the hand held controller, or on a PC with data transfer between the controller and PC performed via SD card. • When connected to the ECU, the controller can be used to display the status of a running engine. • Can be used on all KX™ models equipped with DFI. 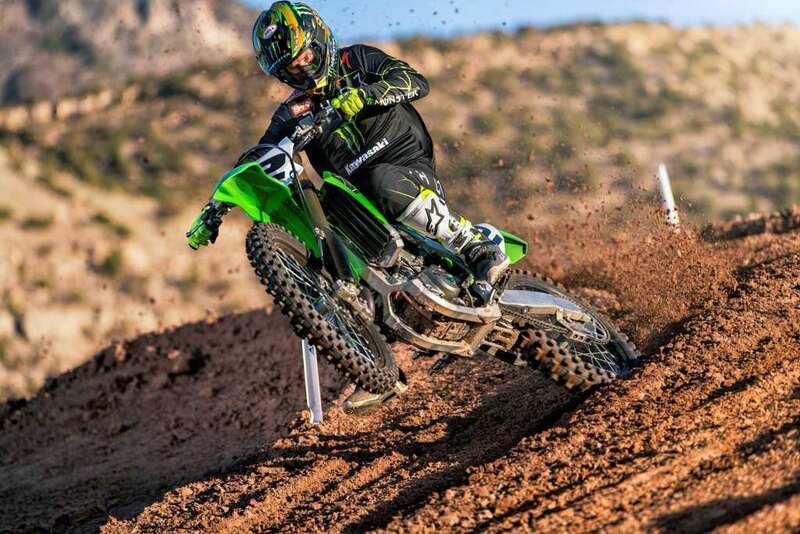 • Similar to the system used on the Monster Energy® Kawasaki factory racers, allows riders to activate a separate engine map designed to assist them get holeshots by pressing a button. • The Launch Control Mode map retards ignition timing, allowing the tire to gain grip in low traction situations, and allowing riders to focus on their lines. 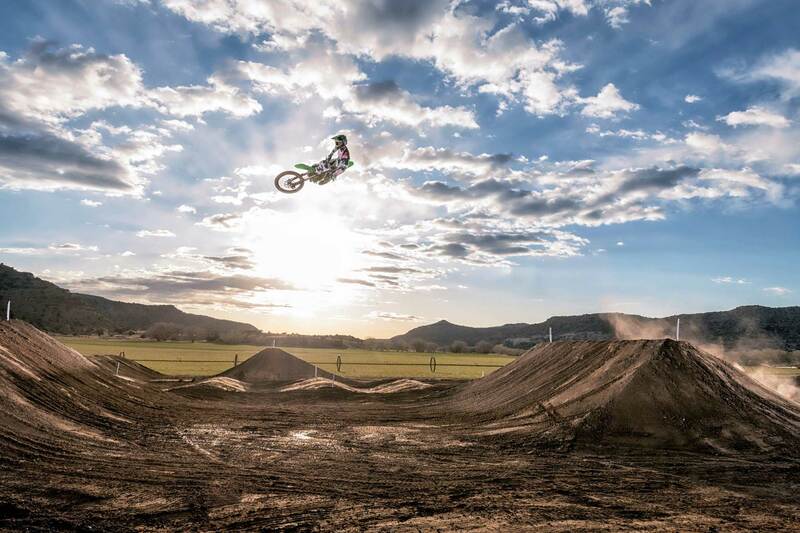 • Even for top-level riders, controlling the massive power of the KX450 off the start requires throttle control and clutch finesse. By slightly reducing this power, Launch Control Mode helps riders maximize traction and increase the chance of getting a good start. • Launch Control Mode has the greatest effect within the first few seconds of releasing the clutch off the start – the most crucial time to get ahead of rivals for better positioning going into the first corner. • Activated by pressing and holding the launch control button, located at the left handlebar, for two seconds or more while in neutral, first or second gear. When activated, the indicator lamp next to the button flashes quickly to let the rider know the system is engaged. • The system automatically disengages when the transmission is shifted into third gear, switching back to the normal engine map. • The Launch Control Mode indicator light also serves as a warning light if the DFI system malfunctions. • An evolution of the current design, the new frame offers a better overall rigidity balance. • The engine is now used as a stressed member, contributing to the frame’s rigidity balance. • Revised steering head area with optimised rigidity, main frame rails with revised cross-sections, and a revised line for the swingarm brackets contribute to the overall rigidity balance. Wider lower frame rails also contribute to overall rigidity balance. • Composed of a combination of forged, extruded and cast parts, the aluminum frame is designed with a balance of torsional and longitudinal rigidity for quick handling. • Design emphasis on providing maximum traction under acceleration. Specific chassis dimensions and design (reinforcing ribs, swingarm pivot, output shaft, linkage mounts and rear axle) placed to prevent chassis squat and improve traction. • New coil spring fork eliminates pre-ride air pressure checks. compression damping pistons and a 25mm cartridge cylinder to be used for smooth action and firm damping. – The inner surface of the outer fork tubes have Showa’s Dimplush™ texture, which features a wave-like finish to help retain an oil film for smoother action. The Dimplush texture also has Kashima coating to create a hard, low-friction surface that helps prevent wear so the sliding surfaces remain smooth for a long time. The lubricating material in the coating contributes to smoother suspension action, especially at the initial part of the stroke, and a better ride feel. – New low-friction fork oil further reduces friction. – Hard titanium oxide coating on the outer surface of the inner fork tubes helps prevent wear, scratches and other damage to the tubes while reducing stiction and improving overall fork action. • Based on feedback from Kawasaki’s factory race teams, the front axle was increased from 20 to 22mm for improved front-end traction. • New linkage ratios contribute to increased rear wheel traction. • All new compact designed rear shock has bigger diameter compression adjuster that helps prevent oil cavitation under high frequency movement and is equipped with items from Showa A-KIT shock technology. • New shock position is shifted 5mm to the right to provide room for the downdraft intake, plus the placement contributes to increased rear wheel traction. height. The additional rear travel offers improved suspension action over a wider range of track conditions. • Dual compression adjustability allows high speed and lowspeed damping to be tuned separately. • The inside of the shock reservoir has a self-lubricating alumite coating that helps prevent wear abrasion and reduces friction for smoother suspension action. • 270mm Braking brand petal front brake disc provides superb stopping power. • Revised front brake master cylinder provides better initial control while contributing to overall braking performance. • New rear Braking brand petal brake disc increased from 240 to 250mm for stronger stopping power. • Revised rear brake master cylinder and brake hose reduce weight. • Petal disc shape helps remove dirt build up in pads, increasing performance. A smoother, flatter rider interface improves the adjustable racer-friendly ergonomics to help riders improve lap times. • New footpegs are 5mm wider front to rear and positioned 3mm further rearward, and the new design is also lighter. • New bodywork is designed to facilitate rider movement with long, smooth surfaces that eases sliding back and forth on the bike. • The top of the fuel tank was redesigned to provide an even flatter progression from the seat to the tank, giving riders greater freedom of movement and allowing them to sit farther forward. • New radiator shrouds are positioned closer to the frame so they are slimmer where the rider’s knees make contact, and the new singlepiece design make them easier to grip with the legs. • The radiators are turned inward 10 degrees, and combined with the narrow frame spars provide a narrow rider interface. • Upper triple clamp provides two mounting positions for the reversible handlebar clamps so that the Renthal handlebar can be set in one of four positions with a 35mm range of adjustment. • The footpeg brackets can be mounted in two positions, allowing the rider to change footpegs height by 5mm. • Green finish on the oil filler, flywheel nut cap and timing inspection cap contribute to factory looks. • A works-style Renthal (standard-type, K971 bend) aluminium handlebar is light yet strong. • Black wheels, triple clamps, and cylinder head covers complement Kawasaki’s racing lime green color. • Lightweight magnesium clutch, generator and cylinder head covers. 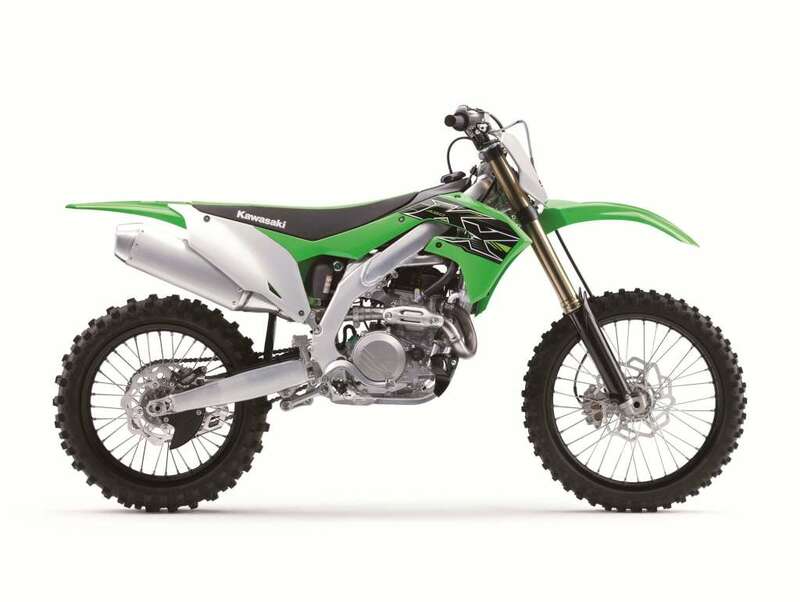 • Optional parts available through Kawasaki dealers include rear sprockets, solid brake discs, handlebar holder for 1 1/8” handlebar, and stiffer or softer shock springs. • The KX graphics use an in-mold process to seal the graphic into the shroud plastic for greater longevity and an ultra-smooth outer surface.